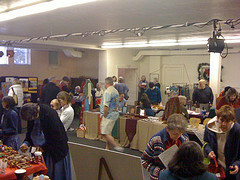 Today dear daughter and I went to the Fair Trade Christmas Market at Bethany Presbyterian Church. The church has done this every year for a long time. The subtitle the event “a different way to Christmas shop”. If you are interested on being on their mailing list for next year, go to their website and email them your information. This entry was posted in Churches, Once in a while events, Places of the Spirit, Tacoma, The Holidays, WA State - Pierce County and tagged alternate, Bethany Presbyterian Church, Christmas, Church World Service, Community, Dough for Doe, El Guetzal, Fair Trade Christmas Market, Fish Food Bank, gifts, Grass Roots Uganda, Heifer, Hfj Community Services, holiday, Jubilee Traders, Kilimanjaro, L’arche Farm and Gardens, nonprofit, presents, Tacoma, vendors, worthwhile on December 5, 2010 by admin.